According to Stockholm International Peace Research Institute, SIPRI, U.S. military spending will be three times that of China and 10 times more than Russia. The U.S. House of Representatives passed the National Defense Authorization Act of 2018, NDAA, with an overwhelming 357 votes supporting the increase in budget and 70 voting against, including 127 Democrats backing the bill. The defense bill will pump nearly US$634 billion in the fiscal year 2018 for key Pentagon operations, with about US$66 billion alone for the war operations in Afghanistan, Iraq, Syria and other countries. Citing North Korea as a threat, the bill aims to bulk up of the military with more ships, aircraft, and troops. Part of the bill is also supposed to strengthen the missile technology against North Korea. North Korea’s U.N. ambassador, Ja Song Nam, wrote in a letter to the UN chief, Antonio Guterres, on Monday, warning that it seems impossible to predict when a nuclear war would break out, pointing to the U.S. aircraft carrier groups for “taking up a strike posture” around the Korean peninsula. The carriers are taking part in joint naval exercises with North Korea. “The large-scale nuclear war exercises and blackmails, which the U.S. staged for a whole year without a break in collaboration with its followers to stifle our republic, make one conclude that the option we have taken was the right one and we should go along the way to the last,” Ja’s letter states. The compromise bill will now have US$626.4 billion in base spending, with US$20.6 billion for nuclear national security programs that fall under the Energy Department. US$65.7 billion will be used for a separate Pentagon war account. Some of the war machines U.S. plans to deploy in its war missions include nearly “28 additional Ground-Based Interceptors which are anti-missile missiles that would be launched from underground silos in Alaska in the event the U.S. decided to try to shoot down a North Korean missile heading toward the United States. The interceptors are designed to directly hit the enemy missile outside the Earth’s atmosphere, obliterating it by the force of impact,” Associated Press noted. 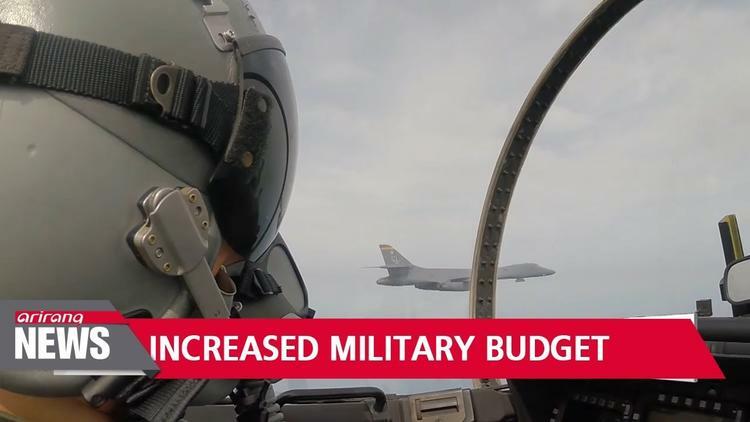 The budget will have room for 90 F-35 Joint Strike Fighters, 24 F/A-18 Super Hornet jet fighters, which are 20 and 10 respectively, more than Trump requested. The bill will move to the Senate after Thanksgiving for the final approval. The proposed budget, the largest in the U.S. history, exceeds the initial budget ceiling of US$549 billion set by the Budget Control Act, along with Trump’s initial budget request of US$603 billion, so the House and Senate leaders will need to “strike a budget deal that increases the caps in order to boost defense spending as prescribed by the bill,” Politico reported. According to the Stockholm International Peace Research Institute, SIPRI, U.S. military spending will be three times that of China and 10 times more than Russia. The bill has been widely criticised for pushing a budget focused on spending for wars whereas vital policies affecting US taxpayers such as universal healthcare, education and climate continue to suffer from neglect in budget spending, amounting to US$80 billion which in itself would suffice to make public colleges and universities in the U.S. free, the Intercept noted.